In modern days, the enhanced flavour of smoked foods makes them a delicacy in many cultures. Smoked furnace is a cooking, drying, smoking and flavouring functions in one’s smokehouse. Specification has outdoor smoker oven, electric smoker indoors, electric smoker cooking, smoker roaster oven, furnace smoking etc. In modern days, the enhanced flavor of smoked foods makes them a delicacy in many cultures. 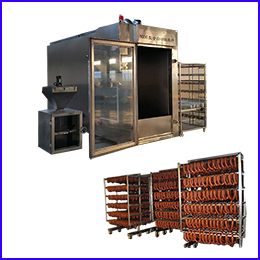 Smoker oven is one smoked furnace for meat product process, such as a variety of sausage, ham, dry intestine, Chinese sausage, barbecue and other Curing process with cooking, drying, baking, and smoking, exhaust, cleaning functions. 1. Outside independent smoking generator and advanced inner circulation smoke generating system make an evenly distributed smoke in smoked furnace. This means uniform coloring will be achieved. 2. Both electricity and steam are option as heating source of smoker oven. 3. One-way in and out of the trolley design or channel type design for opening the door in the front and opposite is option, it’s easy to operate. 4. PLC automatic control operation, all the technical running data is easy to set up with a man – machine interface screen. 5. If necessary, automatic internal cleaning system can be equipped. 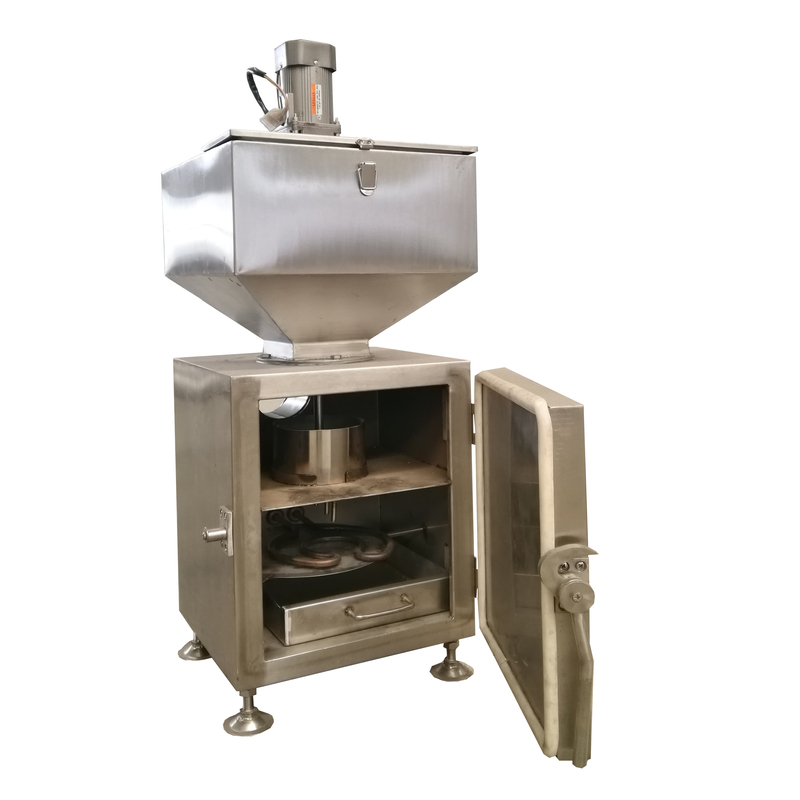 For smoker oven which capacity is 30 to 100Kg/batch, Independent steam generator is standard equipped. Industry boiler is necessary for a smoked furnace which capacity is more than 100Kg/h. Electricity and gas or LPG is all available as the heating source of independent steam generator. Electric heating: electricity heating tube at a set up temperature to make a hot air, the fan blows through internal deflector in smoker oven and make a circulation to finish this drying process. If steam is the heating source, copper coil tubes will be the heating device to heat air which is blows with fan and make a circulation in smoked furnace. Outside independent smoking generator has some features, smoking volume and consistency can be controlled freely. Smoking will be filtered first before entering the smoker oven, the content of styrene acrylic which is harmful to health will be reduced. Even if at a low temperature like 0–30℃ for cooling smoking process,,smoking generator is still running well. Depends on various final smoked food quality, wood and sugar or wood with brown sugar is offen recommended as a colouring material.